N P CORP NO 41 (1962) The 38 ton 60 foot wooden barge N P Corp No 41 foundered in November of 1962 off of Cape Saint Elias. N S 10 (1966) The 8 ton 27 foot wooden gas screw fishing vessel N S 10 was destroyed by fire August 2, 1966 at Koggiung. N S 11 (1966) The 8 ton 27 foot wooden gas screw fishing vessel N S 11 was destroyed by fire August 2, 1966 at Koggiung. N S 22 (1966) The 8 ton 29 foot wooden gas screw fishing vessel N S 22 was destroyed by fire August 2, 1966 at Koggiung. N S 24 (1966) The 8 ton 29 foot wooden gas screw fishing vessel N S 24 was destroyed by fire August 2, 1966 at Koggiung. N S 25 (1966) The 8 ton 29 foot wooden gas screw fishing vessel N S 25 was destroyed by fire August 2, 1966 at Koggiung. N S 26 (1966) The 8 ton 29 foot wooden gas screw fishing vessel N S 26 was destroyed by fire August 2, 1966 at Koggiung. NAGAN (1991) The 40 foot halibut longline fishing vessel Nagan capsized and was lost September 23, 1991 off of Egg Island south of Cordova. Both crewmembers were lost. NAGAY (1880) The schooner Nagay was lost June 24, 1880 off of Falmouth Harbor near Nagai Island. The vessel was owned by McCollum & Company and engaged working for the codfish station. The value of the Nagay was $2,000 at the time of the disaster. No lives were lost. NAKAT (2010) The 52 foot fiberglass halibut fishing vessel Nakat was consumed by fire July 11, 2010 off of Sitkinak Island. All four crewmembers escaped to a life raft and were picked up by the U S Coast Guard. The fire began in the vessel’s galley oil stove. NAKNEK (1987) The 81 foot tender Naknek grounded and sank April 8, 1987 in Wells Bay, Prince William Sound. NAKNEK DIVA (1970) The fishing vessel Naknek Diva was lost July 15, 1970 near Homer. NANA NICOLE (1993) The 30 foot fishing vessel Nana Nicole struck a log and sank August 8, 1993 in Cold Bay. The one person aboard was rescued. NANNIE D (1981) The 32 foot fishing vessel Nannie D sank November 27, 1981 somewhere southwest of Seward. All three crewmembers were lost with the vessel. NASTY HABIT (1982) The 30 foot fishing vessel Nasty Habit capsized and sank in rough weather May 22, 1982 near Hinchinbrook Island 25 miles southwest of Cordova. One person was lost. NAT&T CO NO 3 (1899) Marine Disasters of the Alaska Route reports that the barge N A T & T Co No 3 was lost at Tugidak in 1899. It is further stated that the value of the vessel and her cargo was $73,000 at the time of the loss. Merchant Vessels of the U S (1910) reports the 120 ton barge N A T & T Co No 3 (Built in 1897) foundered at Saint Michael in 1899. NATALIA (2006) The 45 foot salmon seiner Natalia burned and sank August 1, 2006 approximately 16 miles north of the Ugashik River in Bristol Bay. A stack fire spread, got out of control and the Natalia burned to the waterline. The crew was forced to abandon ship in the life raft. All three crewmembers were rescued by the fishing vessel Belina. NATALIA JADE (1983) The crab fishing vessel Natalia Jade caught fire and sank April 20, 1983 in the Shelikof Strait west of Raspberry Island. NATTIE (1946) The 10 ton 32 foot wooden gas screw fishing vessel Nattie stranded and was lost after drifting to sea from Seldovia in May of 1946. NEAH (1945) The 42 ton 58 foot wooden gas screw fishing vessel Neah was consumed by fire November 29, 1945 in Boulder Bay, Prince William Sound. NEDRA (1956) The 11 ton 33 foot wooden gas screw fishing vessel Nedra was consumed by fire September 13, 1956 on Long Island near Kodiak. The Neenah was valued at $10,000 at the time of the loss but Isom did not know if she or her cargo were insured when he filed the casualty report. NEFCO 7 (1964) The 80 ton 66 foot wooden barge Nefco 7 was destroyed by a tidal wave March 27, 1964 at Point Shepard. NEFCO NO 2 (1942) The 30 ton 55 foot wooden scow Nefco No 2 foundered off of Naked Island in Prince William Sound September 28, 1942. NELLIE COLEMAN (1905) The 160 ton 97 foot wooden two masted cod fishing schooner Nellie Coleman departed Squaw Harbor sometime between November 7 and November 10, 1905 bound for Seattle. Aboard were 20 crewmen, Captain Johnson and his Wife and as many as 8 passengers. She was reported to be carrying 65,000 codfish. The Nellie Coleman was out in the same storm that sank the Mary Ann at Unga November 13th and did severe damage to the codfish stations in the same area (S F Call). Several days later, 15 bodies washed up on Yakataga beach and were discovered by minors (The Daily Colonist). No sign of the Nellie Coleman was found. Some rumors of murder and foul play circulated because of a crazed Frenchman found on Unimak Island wearing a dress that had belonged to Captain Johnson’s Wife (Grey River Argus). Included in the list of those lost were Captain Andrew Johnson (45), Mrs. Andrew Johnson (30) (Miss Oune of Green Lake) newlywed, Martin Berg (35) of Seattle, Peter Peterson (25), Henry Otterlie (21) of Seattle, I Gibson (25), Arthur Jensen (22), Emil Peters (27) and Ole Waller (26) (Seattle Times). Comment: This Chernabura Island had its name changed in 1936 to Cherni Island so as not to be confused with the larger Chernabura Island in the Shumagin Islands 90 miles to the northeast. NELLIE JUAN #5 (1964) The barge Nellie Juan #5 was picked up and tossed more than 100 feet inland in Mink Cove, Port Nellie Juan by a tsunami from the March 27, 1964 Good Friday Earthquake. The vessel rests upside down covered in vegetation. The Nellie Juan #33 was valued at $3,000 and was a Total Loss. She had no cargo and no insurance. NELSINE (1950) The 9 ton 34 foot wooden gas screw fishing vessel Nelsine stranded and was lost in 1950 on the Homer Spit. NEPTUNE (1943) The 8 ton 34 foot gas screw Neptune foundered July 17, 1942 at Squaw Harbor. NEPTUNE (1964) The 85 ton 70 foot wooden oil screw Neptune was reported lost at Kodiak in the Good Friday earthquake of March 27, 1964. NEPTUNE I (1973) The fishing vessel Neptune I sank in the Gulf of Alaska March 4, 1973 between Cape Spencer and Kodiak Island, 150 miles south of Middleton Island. All five crewmembers were rescued from a life raft by a U S Coast Guard H3 Helicopter. Weather at the time was calm with light wind and one to two foot seas. The distress call of the Neptune I was picked up by the fishing boat Yakutan. Newspapers reported that a seam had opened up when the vessel sank. The survivors were John W. Daly and Robert S. Wright III of Ketchum, Idaho and Terry Scales, Michael Rodgers and Gary Stewart of Seattle. NERKA II (1998) The 32 foot gillnet salmon fishing vessel Nerka II burned July 19, 1998 at Naknek. The only person on board made it to safety. NEW BAY BEAUTY (1966) The 11 ton 31 foot wooden oil screw fishing vessel New Bay Beauty stranded and was lost September 18, 1966 at East Amatuli Island. NEW DEAL (1942) The 8 ton 27 foot wooden gas screw fishing vessel New Deal burned in Wide Bay July of 1942. NEW ENGLAND (1924) The 29 ton 52 foot wooden gas screw fishing vessel New England lost her propeller six miles from Cape St Elias in an offshore northwesterly wind and the crew of six was forced to abandon the vessel. The New England departed Latouche November 20, 1924 carrying 6,700 lbs. of herring in barrels worth $900. The vessel was valued at $7,000. Both the New England and her cargo were total losses. NEW HOPE (1988) The 35 foot fishing vessel New Hope lost power, went adrift and flooded in heavy seas April 4, 1988 eight miles north of Sutwik Island. Both crewmembers were rescued by a U S Coast Guard Helicopter and taken to Kodiak. The New Hope was listed as a navigational hazard and presumed to have sunk. NEW STAR (1992) On October 14, 1992 the 49 foot vessel New Star, the 29 foot fishing vessel Mary Ann and 32 foot vessel Silver Bullet were traveling together when the Mary Anne got line in her prop. The Silver Bullit took the Mary Anne in tow. While towing the Mary Anne into Mitrofania Bay the Silver Bullit struck a rock. The three vessels tied side by side to keep the Silver Bullit afloat. They then beached all three to make repairs when the tide went out. While the others slept, the owner of the Silver Bullit attempted to heat up his fiberglass hull to dry it out and make repairs. Unfortunately, the Silver Bullit was set on fire and all three burned. There was no loss of life. NICHOLAS THAYER (1906) The 584 ton 139 foot bark Nicholas Thayer was lost with all hands in March of 1906, possibly near Kodiak Island. The vessel departed Seattle January 10, 1906 bound for Seward with a crew of 16 men. Her cargo was 150 tons of coal, 425,000 feet of lumber and 150 tons of general merchandise. The Nicholas Thayer was presumed by many to have been lost near Kodiak because of floating wreckage and cargo found near the east side of Kodiak Island by Natives. She was last seen off of Seal Rocks headed in the general direction of Seward. There was a heavy southwest gale blowing. The Nicholas Thayer was commanded by Captain Charles H Jensen (26) of Denmark. It was his first and apparently last command. Jensen was engaged to be married on his return to Seattle. NIGHT OWL (1986) The gillnet fishing vessel Night Owl flooded and sank August 12, 1986 in Cook Inlet. All three crewmembers were rescued by a U S Coast Guard Helicopter. NIGHT RIDER (1998) The 31 foot gillnet salmon fishing vessel Night Rider burned and was lost August 7, 1998 in Stepovak Bay. The fire was thought to have been electrical in origin. The only person on board made it to safety. NIGHTMARE (1966) The fishing vessel Nightmare went missing November 30, 1966 on a trip from Seldovia to Halibut Cove. Missing with the vessel were Mr. and Mrs. Henry Kroll. 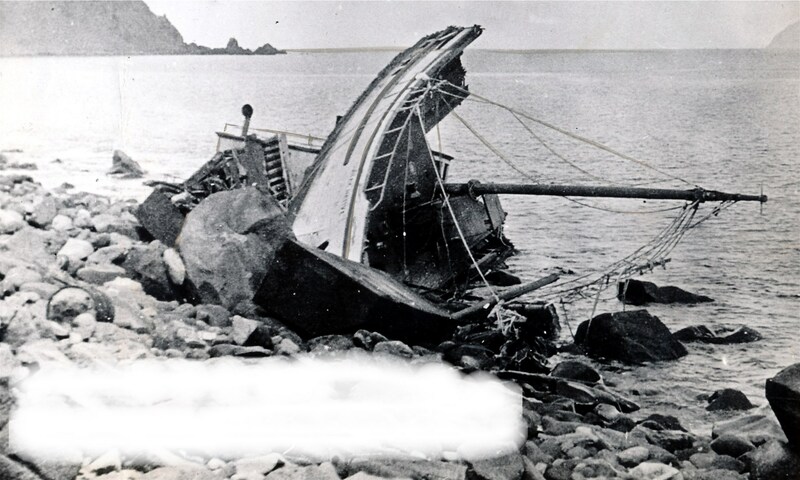 NITTO MARU NO 67 (1970) The 96 ton Japanese fishing vessel Nitto Maru No 67 capsized and sank April 21, 1970 approximately 20 miles off of Unimak Island. All 17 crewmembers were lost. NO 00 (1931) The 98 ton wooden barge No 00 foundered at Cape Greig July 17, 1931. The barge was being towed by the vessel Kvichak from Nushagak to Ugashik. The weather was good at departure but a strong gale was encountered off Cape Greig which carried away the bits of the No 00 and she capsized. The scow and her cargo were lost. The No 00 was carrying an 80 ton load of cans, can ends, boxes and can tops worth $6,600. The scow was reported to be worth $2,000. There was no insurance. No crew was aboard at the time of the disaster. NONPAREIL (1915) The 52 ton wooden gas powered steam cod fishing schooner Nonpareil foundered at Unga Island at 3:30 a.m. March 13, 1915. She departed Baranoff Harbor on a cod fishing trip with seven crewmen aboard. The vessel was attempting to lower sails and anchor when her chains parted and she drifted ashore and sank by her stern. It was a dark night with heavy seas and a gale blowing at the time of the disaster. The Nonpareil was valued at $8,000 and her 30 ton cargo of salt and provisions at $600. The crew made it to safety. NORA (1948) The 62 ton 68 foot wooden oil screw Nora foundered October 6, 1948 off Middleton Island. NORDFJORD (1987) The 127 foot trawler Nordfjord disappeared with all hands September 19, 1987 approximately 200 miles south of Valdez in the Gulf of Alaska. The vessel was travelling from Seattle to Unimak Pass with five persons aboard. Skipper Gudjonroy Gudjonsson spoke to his father, owner of the Nordfjord, September 18th as they were travelling about 900 miles east of Unimak Pass. A brief mayday was heard early on the 19th at the Coast Guard Station in Kodiak. Weather at the time of the disaster was 14 to 16 knot winds and 4 to 6 foot seas. All that was ever found was a single orange buoy. Lost were skipper Gudjonroy Gudjonsson (28) of Bellevue WA, Marty Mercer (24) of Seattle, Chris Boss (21) of Seattle, Greta Halgorsson (40) of Iceland and Bill Schmalfeldt. NORDIC DANCER (1999) The charter vessel Nordic Dancer flooded and sank at 2:26 p.m. June 17, 1999 near the tip of Spruce Cape northeast of Kodiak. All five persons on board were rescued by the motor vessel Popeye. NORDIC MISTRESS (2011) The 60 foot luxury charter yacht Nordic Mistress sank May 22, 2011 while traveling from Kodiak to Prince William Sound. The vessel was about 60 miles east of Seward when she lost her main navigation system in heavy weather. Waves to 15 feet soon intruded into the Nordic Mistress forcing the five persons on board to abandon ship in survival suits to a life raft after issuing a May-Day. They were rescued 85 miles north of Kodiak by a MH-60 Jayhawk helicopter that arrived on scene within an hour. NOREL (1980) The 30 foot steel crab fishing vessel Norel disappeared with all hands March 17, 1980 near Cape Saint Elias. No trace of the vessel or crew was found despite an intensive search by the U S Coast Guard and local fishermen. Lost with the Norel were owner Joseph Gursky, Roseanna Nasello and John Estrada. NORMAN J (1964) The 18 ton 35 foot wooden oil screw fishing vessel Norman J was reported lost at Kodiak in the Good Friday earthquake of March 27, 1964. NORMAR (1974) The 95 foot wooden oil screw shrimp trawler Normar iced up, capsized, caught fire and was lost February 13, 1974 at Imuya Bay in the Shelikof Strait less than 20 miles from Jute Bay where the John and Olaf experienced a similar fate less than a month before . All five crewmembers of the Normar were rescued by a U S Coast Guard Helicopter. All were suffering from hypothermia and frostbite. Included in the crew were Fred Crabtree, Martin Bakken and his sons Martin Jr., Norman and Tour Bakken. NORTH CAPE (1966) The 86 ton 109 foot steel barge North Cape was destroyed by a tidal wave November 1, 1966 in Cook Inlet near Anchorage. NORTH KING (1955) The 256 ton 99 foot wooden oil screw fishing vessel North King stranded and was lost August 10, 1955 on Unimak Island between Sennett Point and Scotch Cap. NORTH SEA (1968) The wooden diesel screw crab fishing vessel North Sea stranded and was lost December 12, 1968 on Unimak Island near Cape Sarichef. Three crewmembers were lost including skipper Edwin T Grabowski of Bellevue WA, Elmer Thomas Olsen of Seattle WA and Paul Hansen of Seattle WA. Ben Golodoff (Golodov) of Unalaska was the sole survivor. Golodoff made his way to Sennett Point and was found by a group of Coast Guard personnel. He suffered from hypothermia and frostbite. NORTH WIND (1944) The 2,448 ton 298 foot oil powered passenger steamer North Wind stranded and was lost December 14, 1944 near Simeonof Island at Lat. 54 52 Long. 159 10. NORTH WIND (1964) The 21 ton 45 foot wooden oil screw pleasure vessel North Wind was destroyed by a tidal wave March 27, 1964 at Seward. NORTH WIND (1964) The 32 ton 50 foot steel oil screw tug North Wind foundered December 17, 1964 about five miles east of Cape Spencer. NORTHERN AURORA (1999) The 30 foot wooden long line cod fishing vessel Northern Aurora iced up and overturned 150 yards off of Caines Head Beach February 3, 1999 and washed up approximately eight miles south of Seward on the west shore of Fox Island. Ed Cantrell (26) was lost in the disaster. Neil Marolt (28) was rescued after two and a half hours in the water. NORTHERN BELLE (2010) The 75 foot steel fishing vessel Northern Belle flooded and sank April 21, 2010 in the Gulf of Alaska 50 nautical miles southeast of Montague Island. The U S Coast Guard responded to the distressed vessel and was able to retrieve all four of her crewmembers. Three survived with severe hypothermia. Captain of the Northern Belle, Robert Royer was not able to survive his injuries and the hypothermia. An eight year old Cocker Spaniel named Baxter that belonged to Royer was also lost with the Northern Belle. NORTHERN CHALLENGER (1987) The 80 foot fishing vessel Northern Challenger sank March 6, 1987 off of Ugak Island. The four crewmembers aboard were picked up by the fishing vessel Saint Janet. NORTHERN DREAM (1978) The 21 foot Northern Dream caught fire May 29, 1978 on the east side of Crooked Island near Kodiak. The three crewmen were rescued by a “Goose” from Kodiak Western Airlines. NORTHERN EAGLE (1799) The Russian schooner Northern Eagle (Severnyi Orel) was blown onto the rocks and lost near Prince William Sound in 1799. Six crewmen were lost along with a 22,000 ruble cargo of furs. The vessel was travelling between Yakutat and Kodiak via Prince William Sound when the tragedy occurred. NORTHERN KING (1928) An explosion and fire destroyed the 11 ton gas screw Northern King at the wharf in Shearwater Bay at 10 a.m. October 20, 1928. The vessel had a crew of four, but only the engineer was aboard when the casualty occurred. He was able to escape without injury. Gasoline in the engine room caused the explosion. The Northern King was valued at $3,000 and had no cargo aboard at the time of the loss. NORTHERN KING (1981) The 96 foot aluminum trawler processor Northern King capsized and foundered August 21, 1981 near Nelson Lagoon. The vessel developed a heavy list during a storm off of Cape Lieskof in the Bering Sea. Her seven crewmen abandoned the vessel when she was four miles off of the Alaska Peninsula. Lost in the disaster were James A Eiden (55) of Everett WA and Eric Willis of Anchorage. Five others made shore in a life raft and survived until rescued. NORTHERN PRIDE (2015) The 82 foot wooden fish tender Northern Pride flooded and burned April 21, 2015 in Kennedy Entrance. The vessel had been dry-docked for eight months at Seward and was on her way to Togiak to work as a tender. She began taking on water immediately after leaving Seward. Soon after that fuel problems began plaguing her engine room. Her main and auxiliary engines abruptly quit and not long after that the vessel caught fire. The three crewmembers abandoned ship to the life raft in survival suits after putting out a distress call. A Good Samaritan fishing vessel, the Dancer, rescued the crew from the life raft near Stevenson Entrance north of Kodiak Island. The hulk of the Northern Pride drifted to Cape Chiniak where it was scrapped and hauled away. NORTHERN REEL (1951) The 8 ton 30 foot wooden gas screw fishing vessel Northern Reel was consumed by fire December 13, 1951 at Wosnesenski Island in the Shumagin Island Group. NORTHERN TRAVELER (1999) The 29 foot fiberglass longline halibut fishing vessel Northern Traveler took on water and sank September 23, 1999 at Round Island in Bristol Bay. No one was aboard at the time of the disaster. NORTHLAND (1954) The 47 ton 55 foot wooden gas screw fishing vessel Northland foundered July 15, 1954 off of Elizabeth Island in Cook Inlet. The Northstar was valued at $2,500 at the time of the casualty and had neither cargo nor insurance. NORWEGIAN WOOD (1981) The 58 foot crab fishing vessel Norwegian Wood capsized and sank November 29, 1981 approximately 45 miles southwest of Homer. Four of five crewmembers were rescued by the fishing vessel Mary M. One crewman was lost. The Nor’West was valued at $200 and her 5 ton cargo of general merchandise at $500. The cargo was salvaged but the vessel became a total loss. There was no insurance. The Nor’West had last departed Kodiak with a crew of three headed for Wrangel Bay. The crew all made it to safety. Source: U S Customs Wreck Report January 13, 1903 at Kodiak by K W Sargent, Deputy Coll. & Insp. NOVIC (1997) The 37 foot longline cod fishing vessel Novic flooded and sank March 1, 1997 in English Bay. Both crewmembers made it to safety. NOWITNA (1999) The 125 foot steel opilio crab fishing vessel Nowitna took on water, flooded the engine room causing the engine to die, and then sank in heavy weather January 22, 1999 approximately 70 nautical miles west of Cold Bay in the Bering Sea. She was enroute from the crab grounds to King Cove. All six crewmembers were rescued by a U S Coast Guard Helicopter and taken to Cold Bay. The cause of the flooding was thought to be from hull failure brought on by an earlier grounding at Cape Lutke on Unimak Island, a missing port void hatch cover and heavy weather. Conditions at the time of the loss included winds at 60 knots from the south, seas 25 to 35 feet and low visibility. The Nowitna was a converted Navy Yard Freighter. NUGGET (1909) The sloop Nugget was abandoned 75 miles off Cape Fairweather February 14, 1909. Seven crewmen were rescued by the steamer Northwestern, who had sighted the flare of the Nugget. The Nugget had departed Lituya Bay February 8, 1909 bound for Juneau but had gotten blown out to sea off Cross Sound the following day. A second storm struck the vessel February 14 destroying most of her sails and rigging. The rescued crewmen of the Nugget were transported by the Northwestern to Juneau, arriving on February 15, 1909. NUKANU (1989) The fishing vessel Nukanu sank June 1, 1989 off of the Copper River Flats. NUNIVAK (1955) The 49 ton 51 foot wooden oil screw fishing vessel Nunivak foundered November 11, 1955 at Kodiak. The crewmen escaped to safety, but the Nuten, valued at $10,000, was a total loss. The only insurance the vessel had was $10,000 worth of fire insurance.